From the authors of Rich Dad Poor Dad, Robert Kiyosaki tells you more secrets on how you can get rich and stay rich for the rest of your life in this newly released title - Rich Dad's Retire Young Retire Rich. Within 10 days of its release, Richs Retire Young Retire Rich climbed to the bestseller lists of The New York Times, The Wall Street Journal and USA Today! In this book, Kiyosaki tells you how he could retire young with his future financially secured, and how an ordinary person can do the same. He shares the financial strategies that helped him go from having nothing in 1985 to becoming financially free and retired by 1994, at the age of 47. For years, people laughed at Robert Kiyosaki's unconventional and unbelievable remarks and ideas of getting rich. Today, many people are beginning to listen to Kiyosaki's message and investment advice that have been proven effective and successful. This book is written in an easy-to-follow format so you know exactly what the authors are leading you to. Kiyosaki once remarked, 'there are better, faster, and safer ways to invest." 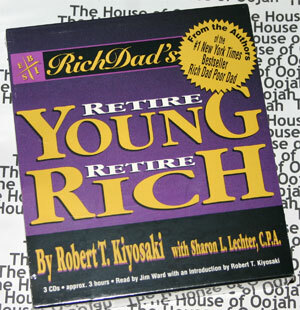 This book is for anyone who do not plan to work hard all of his/her life, and who wants to retire young and retire rich. In 1985 Robert founded an international education company that taught business and investing to tens of thousands of students throughout the world. Retiring at the age of 47, Robert continued with his love of investing. It was during his "retirement", he wrote Rich Dad Poor Dad, the #1 New York Times bestseller. Robert followed with Rich Dad's CASHFLOW Quadrant and Rich Dad's Guide to Investing - all 3 books have been on the top 10 best-seller lists simultaneously on The Wall Street Journal, USA Today and The New York Times. In January 2001 Robert launched Rich Kid Smart Kid. Concerned about the growing gap between the "haves" and "have nots" Robert created the patented board game 101 to teach individuals the same financial strategies his Rich Dad spent years teaching him...the same financial strategies that allowed Robert to retire at the age of 47. Although Robert's business is real estate, trading and building businesses, his true passion is teaching. He is a highly acclaimed speaker on financial education and his work has inspired audiences worldwide. Robert has appeared on Oprah and other top national TV and radio shows. Robert has a profound message for those wanting to improve their financial lives. That message is: "With every dollar in your hand, you have the power to choose to be rich, poor or middle class." T. Harv Eker's audiobook should shake even the most entrenched negative thinkers out of their easy chairs.